Three years ago when we bought this house, we lived without a real kitchen for four months. My “kitchen” consisted of a toaster oven, two electric burners, a microwave, and a utility sink to wash everything in. We were also on a very limited budget, and I had to cook as much from scratch as possible. Those were the days before a rambunctious little boy made his appearance, but it was still quite the feat. I found myself having to simplify everything…including my utensil drawer. When we finally moved into our newly finished kitchen, I was overwhelmed by the amount of cooking utensils I had to work with. I quickly pared them down. From time-to-time I still sift through them and get rid of what I don’t need. 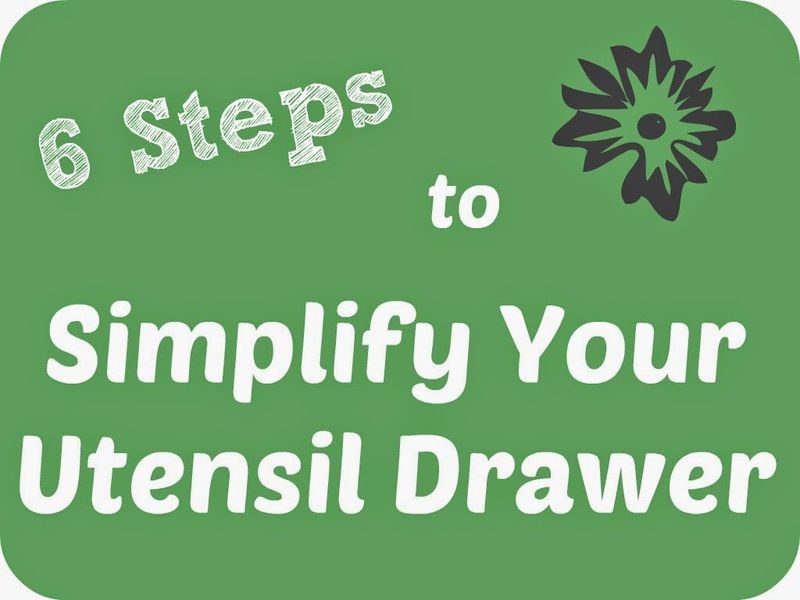 It saves my sanity, makes an organized drawer a lot more attainable, and cuts down on dishes (because I reuse instead of getting something new out constantly). 1.) Pull everything out and lay it on the counter. It’s much easier to see what you have when it’s all out in the open. 2.) Set aside the things you use daily. These are probably different for every person. For me, these include at least one wooden spoon, a spatula, a scraper, and a vegetable peeler. 3.) Add the things that you need on occasion. I may not use it daily, but I do need a can opener (unless I want to go all mountain man and use a pocket knife…heh). I also need a cheese grater, meat thermometer, pizza cutter, rolling pin, etc. 4.) Evaluate if you can do without the rest. Sure, a rotary grater and an apple slicer are nice. Honestly, though, do you use them enough to make keeping them worthwhile? When you make that apple pie once a year, would it that much harder to slice the apples up with a knife? Weigh the benefit having a cleaner, neater drawer with the usefulness of the item. 5.) Reevaluate multiples. Do you really need 6 wood spoons or 4 spatulas? The odds are, probably not. I’d keep enough to be able to have separate utensils for anything touching raw meat, and pitch the rest. 6.) Put everything back. I like to group my utensils according to use. I also like to nest my wooden spoons. However you organize them, I can guarantee that it’ll be a lot easier without all the excess gadgets you once had. Your sanity and your efficiency will thank you. Nice tips! I do it in a similar way. 🙂 Thanks for sharing!